Veteran director Ridley Scott's latest offering All the Money in the World is a film that has gained notoriety on it's release for the eleventh hour replacing of Kevin Spacey with Christopher Plummer but aside from the scandal that surrounded it's production it is in it's own right an absorbing thriller with some masterful performances contained throughout. This true life feature follows the kidnapping of 16-year-old John Paul Getty III (Charlie Plummer) and the desperate attempt by his mother Gail (Michelle Williams) to convince his famous billionaire grandfather (Christopher Plummer) to pay the ransom. When Getty Sr. refuses to pay the much needed ransom, Gail battles to persuade the billionaire as her son's captors become increasingly violent and brutal. With her son's life hanging in the balance, Gail and Getty's advisor (Mark Wahlberg) become unlikely allies in the race against time to save her son and ultimately reveal the true and lasting value of love over money. 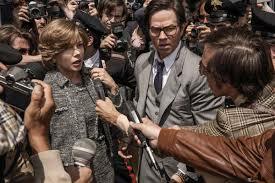 All the Money in the World is a film that thrives on the energy, zest and talent of two contempories both in their eighties yet showing an appetite for their craft that is timeless. Director Scott proves once again that he is the master of the big budget production whilst simultaneously giving such a magnificent visual spectacle the heart, respect and moral message this story so richly deserves. The tension created by this skillful director is unparallelled in anything I've experienced in recent times at the cinema and this truly is edge of the seat fare right up to the last shot. Christopher Plummer also delivers a performance well worthy of his Golden Globe nomination and steals every scene he is in adding so much to the role he had inherited. The supporting cast which includes Mark Wahlberg, Romain Duris and Charlie Plummer (no relation) all acquit themselves quite well and add to this heart stopping and captivating film but the pick of the supporting bunch is undoubtedly Michelle Williams who after last years masterful display in Manchester by the Sea delivers emphatically again as distraught mother Gail in a role that must surely gain recognition come awards season. Quite simply, All the Money in the World is a film that combines stunning visuals, nerve wracking tension, some excellent acting performances tightly wrapped in a strong moral message. Overall not a bad way to spend the 133 minute in what is shaping up to be great month for cinema releases.